Rosey Day: Teddy Bear & Friends merges with Teddy Bear Review!! Teddy Bear & Friends merges with Teddy Bear Review!! WOW! Just wow ... can’t say this is what i was expecting to be reading over my first cuppa of the day :o/ but it's official! TBR's facebook page has updated with the news, including a link to the story on their website, but TB&F has made no comment/acknowledgement (yet) as far as I've seen. Basically the story is that the two main (paper print) US bear magazines will now be combining to form the one magazine, publishing under the name of Teddy Bear & Friends (presumably) with a logo that combines the name and font of TB&F and the sweet little paw print from TBR ... please note that last bit is an guess on my part, based on the banner (above) that arrived on the email announcement from TBR. 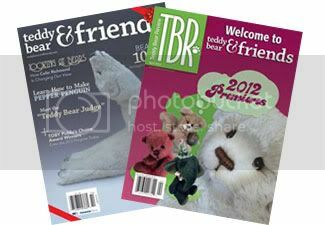 The two premiere publications serving teddy bear collectors,Teddy Bear & Friends and Teddy Bear Review,will merge into one title in 2012 published under the name Teddy Bear & Friends, published on a bimonthly schedule by Jones Publishing. The deal was announced Jan. 27 at the Debut of Dolls and DOTY Awards Banquet during IDEX trade show in Orlando, Fla. Jones Publishing also presented its Ambassador Award to Barrie and Danny Shapiro of The Toy Shoppe at the same event. Teddy Bear & Friends (TB&F) and Teddy Bear Review's (TBR) sister publications, Doll Reader and DOLLS, will also merge this year. Jones Publishing will retain the title DOLLS and increase its frequency to monthly, including quarterly Dolls Presents: Haute Doll specials. "By working collaboratively with our industry partners, we know that we can help make the industry stronger," said IDEX Vice President Susan Fitzgerald. "This new merger will allow us to reach more people and, in turn, grow the publications and their content. We believe this will also help to develop and expand IDEX, which remains the leading industry show." Teddy Bear Review Publisher Carie Ferg agreed, saying "Uniting two great, long-standing teddy bear magazines into one dynamic title, as well as partnering with IDEX, presents us with a terrific opportunity to use the combined strengths of Jones Publishing and Madavor Media to grow the industry." The April 2012 issue of TBR, which mails Feb. 1, will be sent to both TB&F and TBR subscribers. This issue features a sneak peek at bear artists' new designs for this year. Beginning with the June 2012 issue, the magazine will be released under the Teddy Bear & Friends banner. The new combined magazine will continue to publish fan-favorite columns and features from both TB&F and TBR, including Evelyn and Mort Wood's Antiques Almanac, Ken Yenke's Teddies Reviewed, and Dot Bird's Bear Hospital. TBR subscribers will have the remaining issues of their subscription applied to TB&F; readers who subscribe to both magazines will have their TB&F subscription extended by the number of issues remaining on their TBRsubscription. An FAQ is posted on www.teddybearreview.com to answer questions about the merger, and Jones Publishing has issued an invitation to readers to send feedback, suggestions, and additional questions to the magazine's staff. Contact information and links are posted under the "About Us" link at the top left of the home page. Jones Publishing and Teddy Bear & Friends have committed to have a strong presence at IDEX, which will continue to be owned and managed by Madavor Media. Look for some exciting events sponsored by Jones at the 2013 IDEX show, including the presentation of the 2013 Lifetime Achievement Award! I received the email as well and nearly fell off my chair. Although I thought something was in the air, our copies of TB&F was getting very thin.